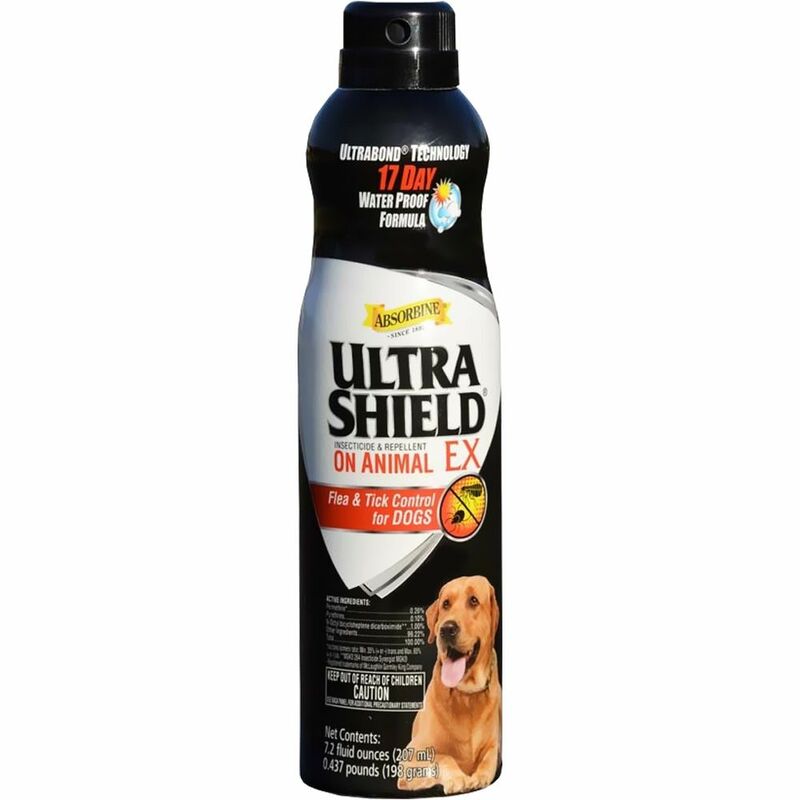 Ultrashield EX Insecticide & Repellent Flea & Tick Control is the most advanced fly control Absorbine offers. The weatherproof formula kills and repels more than 70 species. UltraShield EX Insecticide & Repellent can also function as a premise spray - an important part of your overall fly control strategy. Premise sprays are commonly used to kill biting and nuisance flies, as well as crawling species such as deer ticks and carpenter ants on surfaces inside your barn. It's violation of Federal law to use this product in a manner inconsistent with its labeling. Do not appy as a space, broadcast or spot treatment to indoor surfaces at residential sites. Do not store near or use with oxidizing agents. This product is not for use on puppies less than 12 weeks of age. This product is not for use on animals intended for human consumption. All outdoor applications must be limited to spot or crack-and-crevice treatments only. Except when applying directly to animals. 2. Do not apply this product in a way that will contact adults, children or pets either directly or through drift. Remove or cover exposed food and drinking water before application. Remove or cover dishes, untensils, food processing equipment and food preparation surfaces or wash them before use. Do not wet articles to point of runoff or drip. Do not use treated article until spray has dried. Application is prohibited directly into sewers or drains or to any area like a gutter where drainage to sewers, storm drains, water bodies or aquatic habitat can occur. Do not allow the product to enter any drain during or after application. Hold Container Upright Shake Well Before Using. Spray or wipe-on. Protect your dogs. Ready to use. No mixing necessary. This water-based formulation may be applied directly with spray applicator or as a wipe-on. Dogs & Puppies (Over 12 Weeks of Age): Kills and repels fleas, ticks (that may carry Lyme Disease), mosquitoes and lice on dogs. Also kills and repels fleas, ticks, mosquitoes and lice around premises. Cover animal's eyes with hands. With a firm stroke to get a proper spray mist, spray head, ears and chest until damp. With soft cloth, rub into face around mouth, nose and eyes. Then spray neck, middle and hind quarters, finishing legs last. For best penetration of spray to the skin, direct spray against natural lay of the hair. On long haired dogs, rub against the lay of the hair, spraying the ruffled hair directly behind the hand. Make sure spray thoroughly wets ticks. During the flea season, retreat every 3-4 weeks if necessary. Kills fleas, ticks and lice on dogs and provides up to 28 days protection from reinfestation. Sensitivities may occur after using ANY pesticide product on pets. If signs of sensitivitiy occur, bathe your pet with mild soap and rinse with large amounts of water. If signs continue, consult a veterinarian immediately. Consult a veterinarian before using this product on debilitated, aged, pregnant or nursing animals or animals on medication. Dog's Sleeping Quarters: Spray around baseboards, windows, door frames, wall cracks and localized areas of floors, The pet's bedding areas should be sprayed. Spray old bedding or replace with fresh bedding.